Smokehead - single Islay malt from Ian Macleod distillers presents fantasic Dust Me Down Blues Band! 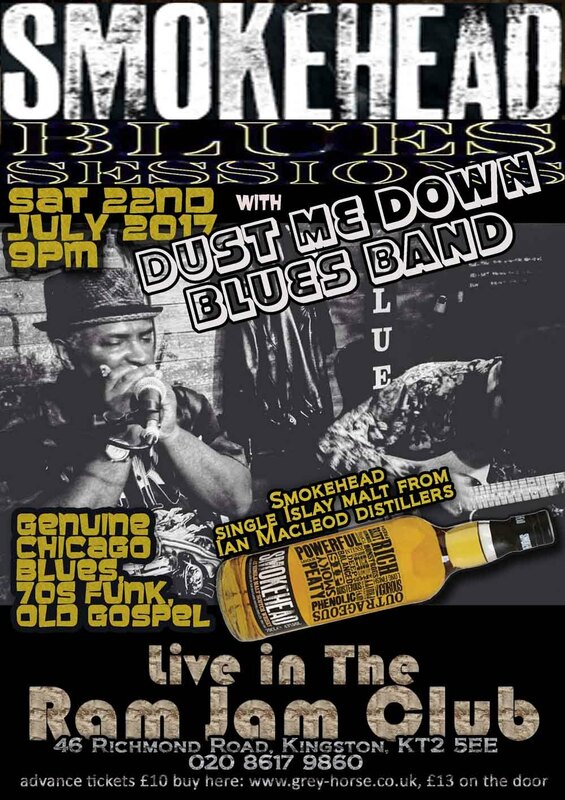 Dust Me Down blues band is based in London. It is composed of professional musicians, well-known in London's blues scene. Ray Wallen is an experienced singer and harp player; he played in several music bands such as Doctor Blue blues band, The Chameleons etc.. Davide Mazzantini is a tasteful guitar player, well-known in the main blues bars in London. He's been performing in Ain't Nothin' But's house band for three years. He also plays in other bands, such as Kingly All Stars, Black Train, Greg Miller blues band. Enzo Strano and Alessandro Cinelli are a tight rhythmic session, able to play blues, jazz, funk. The sound of Dust Me Down blues band is a mixture of black music, moving from blues roots to funky and gospel sonorities. Their song list is composed by genuine Chicago blues, 70s funk, old gospel tunes and some jazzy numbers, giving an exciting show, reaching all tastes of audience. *NB - If seating is important to you, please arrive early as tickets do not guarantee seats. Ram Jam Club opens at 6.30pm.